The Richmond District used to be criss-crossed with streetcar lines. In the early 1970s my grandmother occasionally took my brother and me shopping downtown. We'd catch the 21 Hayes bus at its terminus at Eighth and California and ride it through the battered Western Addition to the marvels of the Emporium, her department store of choice. Based on these Market Street adventures, Grandma decided the 38 Geary was the safer route. We had to walk farther on both ends of the trip, but at least we were moving targets, so to speak. The hassle of lugging shopping bags, helping Grandma control my boisterous brother, and the occasional street violence didn't diminish my excitement over being downtown. I was entranced by the big hotels and stores, the street preachers, food carts, oceans of people, and the endless parade of taxis, buses, cable cars and streetcars. Oh, how I wanted to ride a streetcar! We didn't have any rail lines in the Richmond district and the swamp-green vehicles came right out of a storybook in my mind. The toy-like cable cars moved too slow and looked too babyish for me, but the big round-cornered streetcars gave off the air of speeding spaceships or bullets. Grandma always turned down my requests, because the streetcars didn't run anywhere we needed to go. She once consoled me with plans she'd heard of to run streetcars down Geary Street "in a few years." Almost all the bus routes Richmond district residents use to get out of the neighborhood were originally streetcar lines. The 1 California, 2 Clement, 5 Fulton, 21 Hayes, and 31 Balboa served the Market Street Railway Company, a privately owned enterprise that was consolidated into the city-owned Municipal Railway in 1944. 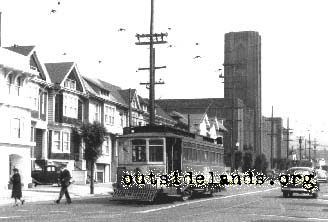 The "MUNI", using a letter-system to denote the routes, originated the streetcar lines that survive today (J-Church, K-Ingleside, L-Taraval, M-Oceanview and N-Judah) to cruise through the Sunset, Ingleside, West of Twin Peaks and other parts of the city. But if you wondered if there were once "A" "B" or "C" cars, the answer is yes! In the late 1800s, a number of private companies had cable and steam lines that served the Inner Richmond. The cable cars that clanged about the sparsely-developed western roads had their own carbarn at the corner of Geary and Arguello. (The building is still there. Take a look inside the "Office Max" second-floor parking lot to see the brickwork.) Population in the area was small, but San Franciscans came from all over the city to visit Golden Gate Park, the cemeteries (back when people took a picnic and spent a day visiting the graves of ancestors), and the Bay District Race Track. While a couple of routes reached as far as the Cliff House and Sutro Baths, most terminated around Fifth Avenue beside Golden Gate Park. The shelter station for the Powell Street Railway line can still be seen just inside the park at Seventh Avenue and Fulton. That the cars could fit through this portal gives one an excellent idea of their diminutive size at the time. One of the railway companies, the Geary Street Park & Ocean Railroad (GSP&O), served the major artery to the Richmond courtesy of a yearly-renewable franchise granted by the city. The line carried passengers out Geary Street from Kearny and Market streets and terminated at Fifth Avenue and Fulton, where a horse helped the cars turn around for the trip back. In the early 20th Century, a popular reform movement named Progressivism responded to the rampant corruption and shady collusion between corporate interests and government. High on the Progessivist agenda was the push for the public ownership of all utilities. This political force, along with general dissatisfaction over the small, six-mile per hour GSP&O cars serving a growing neighborhood, spurred the city to take advantage of the transit company's annual franchise expiration, and establish on Geary Street the country's first municipal railway. The plans for MUNI began at the turn of the century, but court challenges and bond proposition failures put off the construction of a modern municipal electric railway for years. The way was eventually cleared, the last GSP&O car ran on May 5, 1912, and the Department of Public Works began the heavy work of digging the old cable car machinery out of the Geary Street pavement, replaced by trolley lines above. On December 28, 1912, Mayor James Rolph opened the Municipal Railways' first lines, both serving Geary Street. The "A" Geary-Park traveled from downtown out to Tenth Avenue, where it made a left, terminating at Golden Gate Park. Passengers could transfer to the "B" Geary-Ocean line to get all the way to the beach. A few years later, a "C" line traveled west out Geary, made a right at 2nd Avenue, and served California Street (via Cornwall) to 33rd Avenue. Meanwhile the Market Street Railway had gobbled up most of the independent companies by 1921. Despite having some of its franchised routes unrenewed by the city (to be replaced with MUNI lines), the company continued to compete. Their 31 Balboa, the last new streetcar line in the city, essentially killed off MUNI's A Geary-Park line when it opened in 1932. The A, first to open, became the system's first line to end service. In addition to the numbered lines already mentioned, MSR's famous "white front" cars served the Richmond district with the 4 Turk-Eddy (later the 4 Sutter-Sacramento) and the 24 Mission and Richmond, which connected residents across town to Bernal Heights. For years, the public rejected at the polls bond issues authorizing MUNI to purchase the much larger Market Street Railway. After winning a bond measure funds in 1947, MUNI set to work modernizing the entire system. This meant taking out the old streetcars and cable cars to replace them with trolley and motor coaches. The cable car lines were whittled down to the few tourist-focused ones left today, and those only survived after some memorable battles between the city and the public in the late 1940s and early 1950s. Streetcar lines across the city disappeared. Almost every streetcar route to the Richmond was converted to bus service in 1948 and 1949. The B and C-lines ( with the C now shortened and acting primarily as additional B service), alone hung on, still rattling up and down Geary. Part of the Bay Area Rapid Transit (BART) master plan developed in the 1950s was a subway through the Richmond district leading to Marin County. To some, this blueprint provided sufficient justification to pull the tracks off Geary Street. Buses would serve fine until the tube zipped travelers around at high speed, right? There were cries to save the streetcar, all the same. George Christopher, running for mayor in 1955, promised the B-line would stay until the rapid transit plans became finalized. Before Christopher had completed his first year in office he flip-flopped. On December 29, 1956 the B and C lines took their last runs, replaced by buses the next day. BART never arrived. The only streetcar survivors owed their existence to the expensive tunnels and right-of-ways they used that made buses impractical. Not that there weren't attempts in the car-mad 1950s: paid studies investigated making the Twin Peaks Tunnel suitable for automobiles. Jack Tillmany recently wrote me: "At the time trolley service was discontinued, residents of the Richmond district were promised light rail service in the future. Forty-five years later, it's still in the future." In February 2002 MUNI general manager Michael Burns announced a new vision for the transit system. One of the top priorities is a subway/surface light rail line for the enormously busy Geary corridor. "Phase One" in the plan to return rail is estimated to cost $346 million. "Phase Two" (when light rail cars actually make an appearance) is estimated at $1.6 billion. Images: 1) 2-line car on Arguello at Euclid, 1948. From the collection of Jack Tillmany. 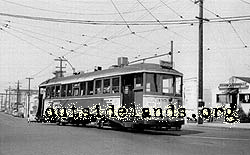 ; 2) B-line car heading east on Balboa at 33rd Avenue in 1950. From the collection of Jack Tillmany. Sources: 1) Inside Muni, John McKane and Anthony Perles, Interurban Press 1982; 2) The People's Railway, Anthony Perles, Interurban Press 1981; 3) Tours of Discovery, Anthony Perles, Interurban Press 1984; 4) Jack Tillmany and John Coll correspondence, 2002; 5) When Steam Ran on the Streets of San Francisco, Walter Rice Ph.D. and Emiliano Echeverria, courtesy of the Cable Car Museum Web site; 6) A Vision for Rapid Transit, MUNI Web site, 2002. Page launched 8 May 2002; Updated 21 August 2003.